First up, one of the machines that have proven most elusive to me so far, has been a red (or maroon) Corona 4 typewriter. They’re not the greatest to type with, sure. But they are incredibly stunning. 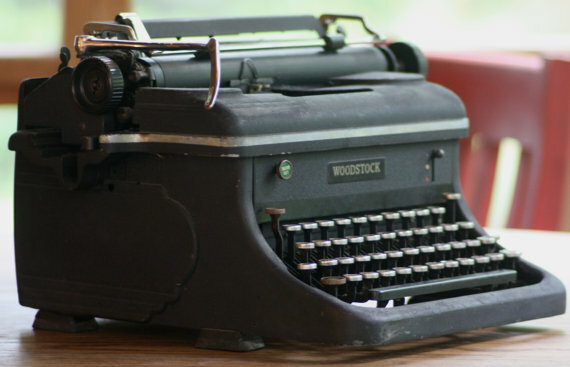 Also, I have a weird thing for the late model Woodstock typewriter. With its bold deco styling on the sides, and its odd industrial green colouring, there’s just something about this machine that I like. Maybe it is because it would fit nicely into my Art Deco typewriter collection. And finally, there’s a piece of industrial art from the now defunct East Germany that I would LOVE to get my hands onto. 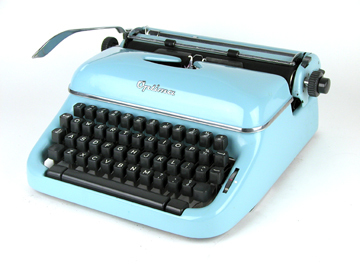 A blue coloured Optima typewriter. It has beautiful curves that are just perfect for the soft tones of the paint. It looks wonderfully elegant. I just want one!